It has been a crazy week. Having taken over our after-school program Kid’s Club, I find that I am forced to become a much more organized person. So far my days have been filled with pulling twelve-hour days only to come home to more grading and planning. The week has also been filled with meetings. These are the kinds of meeting that I like, meetings that are centered clearly on our students. Earlier this year our school won an award for being a “New Wisconsin Promise School of Recognition.” Despite being a rural school with few resources we have managed to get 100% of our sixth grade students meeting or exceeding our state testing requirements. You would not know it by how hard we are working to not only meet the needs of our students, but to exceed them. We have spent the week poring over multiple tests and informal assessments trying to find areas of improvement, trying to use the tools we have to raise an already high bar higher still. I listened to a radio program a few years ago about the Numi automotive plant in Oakland California. It was a GM plant that was built as a result of a partnership with Toyota, GM’s chief rival. 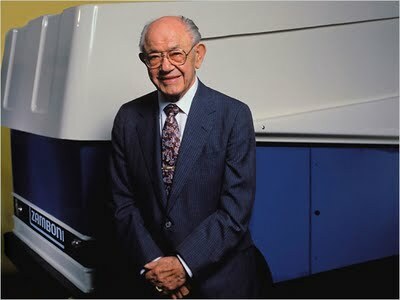 The “Toyota Way,” as it was called, was for a system of continuous improvement in which everyone at every level was responsible for quality control and eliminating wasted time. What if more schools were run like that, where it was everyone’s job to see kids succeed? It’s working with people this committed that makes me proud of where I am and who I am working with. There are days that I miss my landscaping jobs, where I knew clearly when the job was done, with teaching, you never are done. With 100% of the kids meeting our goals, we are still not done! I know I am in the right line of work because even as I drive home from a 12 hour day to a stack of papers that need grading and lesson plans to chart out, I can’t wait for tomorrow, where I will be surrounded by professionals who put our clients first, where I pay off my students in jelly beans and animal balloons and the same little girl in kindergarten will yell at me across the cafeteria and tell me that I smell like a clean cow, whatever that means. I am head of the Elementary School Science Club in Greenwood and this week we started one of my favorite units: computers. The goal of this unit is to show students the overall theory of how computers work. Many of these kids don’t see the computer as anything special anymore; it’s an appliance like a lamp or a toaster that simply works. The concepts of hardware, software, memory, and RAM are all lost on them. The best way to show kids how computers work is similar to teaching them how an engine works: take it apart, rebuild it, and make it work better than before. Last year I did this for the first time and nearly tore my hair out. I had two pretty well-equipped machines, older but not ancient, and I loaded them up with the excellent Ubuntu brand of Linux. Now, Ubuntu runs like a dream on newer computers, has great components, installs quickly, and if I were so inclined I could probably cut the cord and use it day to day if it were not for a few Windows/Mac holdout applications. That said, these older machines are now, well, old. Period. Two even OLDER machines were then donated by our music teacher, who wanted the computers retired and put to good use. A whole wall of my classroom looks like a junkyard. As it happens, all four computers are too slow to load Ubuntu. I tried a few alternatives, but most Linux installs are very complicated (at least for me) and require you to know at least some code. I don’t know code. I don’t have time to learn, and expecting that from my students is crazy. Luckily, I discovered this man’s best friend: Puppy Linux. As its name implies, Puppy is very small and very friendly—129 MB in all. It installs onto a CD or flash drive very easily. Then, just insert your disk, reboot your machine, and within five seconds (really, it’s that fast) you have a slick little operating system complete with web browser, word processor, spreadsheet software, and even a few multimedia programs and games. And it does this all WITHOUT INSTALLING OR ERASING ANYTHING! Any changes or new software you add are put on the nearest disk (hard drive, flash drive, or CD) in a hidden file without affecting your main OS. Everything is very, very easy to use—easy enough for my 5th graders to go it alone and learn the ropes of what an OS does. All the network settings are easy to find and we managed to get our proxy settings and a new browser installed in a few minutes. I found myself excited over a yellowed, 10-year-old tower; in short, this amazing OS really breathes new life into old machines, making them great again. One student took a disk home; she and her mother got it running on her laptop, connected it to wireless, and checked mom’s Facebook. Two boys who live only for tractors and hunting are excited by installing network printers. One even wants to see if he can use Puppy Linux to fix up his grandma’s computer. 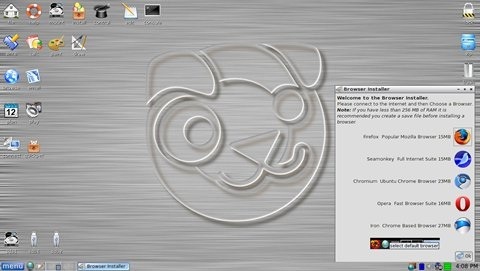 Puppy can be used to teach computers to students, or to refurbish an old lab with a basic browser/word processing setup. I am a Mac user now, full of smugness over the stability of my machine; but seriously, if I still had a PC I would keep a Puppy disk around just in case I got a virus or the machine died on me. Within a few minutes, I could pull off my files and check my email using this adorable life raft of an OS. If you want to have a little geeky fun, download this Puppy. It is a great way to explore Linux without compromising your machine. The sign came that it would be an interesting week when I locked my keys in my car Monday morning within sight of my principal. It was a foolish thing really, since I had taken all of my teacher’s guides home along with my iPad and all were now safely locked up. I decided to handle it with grace. After all, what good would being frustrated get me? So I called the local police and Chief Bernie Bock came by within half an hour and got me back into my car. One of the benefits of a small town, I guess. The day went very well after that, but I should have taken it as an omen for the week to come. Tuesday went well. I’d managed to remember my keys and get a start on planning the coming after school program, when in the middle of the before-school conversation my projector exploded. Well, not the projector, but the bulb inside it, a pop like firecracker and smoke, even. But again, I managed to handle this speed bump with grace. I rolled the mobile board in the library into my classroom, after many thanks to the librarians, and I was up and running. Again. Grace. The ability to respond in a positive manner to negative things, usually outside of your control. The little technical things have been adding up lately, but I am aware this is a trend that will soon pass. A bad week; in many ways it has made me more versatile, because like anyone in Wisconsin can tell you, there is no better teacher than adversity. You only need to find yourself in a ditch once in sub-zero white-out conditions to remember to pack a tow-rope and a candle in your trunk for the rest of your life. I will now treat every day as a day when my projector could explode. The lesson I choose to take from this is that I should never have all my eggs in one basket. I can’t build my whole classroom around my blog, my iPad or my SMARTboard, I need to have backups for everything, because in the end, the only thing anyone can count on is the unpredictable nature of your classroom and your own versatility. I am persecuted relentlessly in my school every day. Every day I drive to work I am openly mocked by my students for my way of life. I speak, of course, of my 2007 Toyota Yaris. 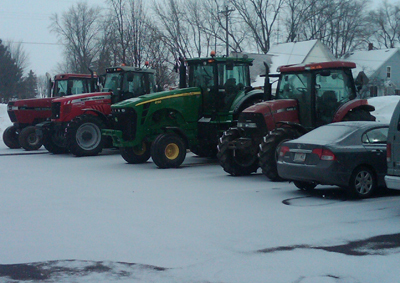 Greenwood, a farming town of around 1000 people, is solidly truck country. There is some debate between GM and Ford, but a man without a truck makes as much sense as a cow walking on its hind legs. My entire car fits in the wheelbase of most of my students’ beloved trucks. And for this, I am mocked. 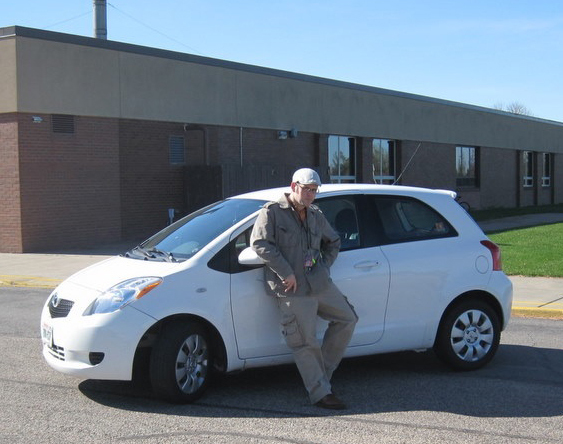 My car has been as dependable as the sunrise, tough as a mule, and nimble as a mountain goat. It has survived every winter for the last five years, been loaded down with a week’s worth of camping gear, driven through snowstorms that dumped two feet of snow on the state, and survived a direct hit from Bambi at 70 MPH. But to my students, there is only one eliminating factor: it can’t tow. It does not matter that I love cars, that I used to work at a racetrack, or that I have seen every episode of Top Gear. My car gets no respect in my classroom. Using Excel’s formula functions, my students were able to use the mileage information on Edmunds to find out how much it costs me to drive any car per mile, per day, and per year. They also were able to look up information such as displacement and MSRP. 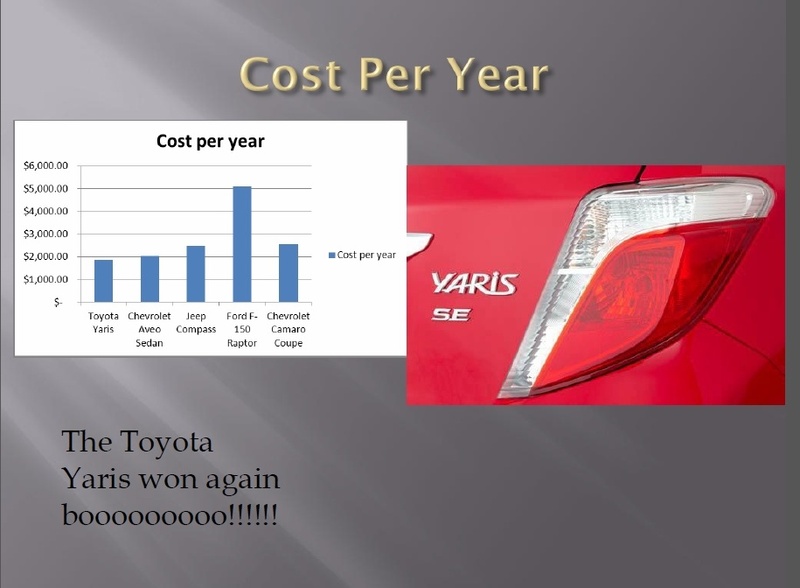 They then created graphs for each of these cars and presentations that tried to ‘sell’ me on a new ride. Imagine the spring in my step when nearly overwhelming evidence pointed right at my car as one of the best for me. I was happy with the runners up, which included the Ford Fiesta, Mini Cooper, and the very cool 2013 Beetle. Maybe it is because I was the last person I know to get a cell phone. Perhaps I inherited the curmudgeon gene that runs deep in my family. Perhaps it is because I am a sad, lonely man without many friends (the faint sound of violins play in the background). Regardless of the reason, I never got into texting very much. I don’t get many texts and I send even fewer. But, guess along with this rock music everyone seems to be listening to these days, texting is all the rage. So much so that I read of one case where a pair of teenagers got lost and texted desperately for help, never thinking to dial 911. In this era of instant communication, voicemails are often ignored by parents, snail mail is tossed in the trash, and only 22% of emails are ever opened. What do people respond to? Well, according to the online service Class Parrot, 98% of text messages are opened. Many homes don’t have the money for Internet access, but nearly all have cell phones. The question is, how do we reach a population that communicates by texting while still maintaining professional and ethical boundaries? Thankfully with every problem comes a solution. Class Parrot is a free service, currently in beta testing, that allows parents and students to text with teachers without the teacher needing a cell phone. A teacher simply sets up an account and gives out a code to their students and parents. The students and parents text the code to the Class Parrot number and instantly the teacher can send and receive texts to the community without ever knowing anyone’s number. Privacy for all parties is ensured. When could this be useful? Only a million times a day! Send a text to parent that a permission slip is coming home, remind a student about an assignment, receive a text request for homework help that you answer at your convenience. This is another example of a great company whose time has come, I have only just begun using this service, but I am sure it will find a place in my online arsenal along with wordpress.com and Spelling City. I am a creature of habit. One of my habits is getting up very early in the morning, partly because I have a long commute and partly because one of my joys is having a big breakfast of bacon and eggs every morning. While I was busy cooking the other day, I overheard a story on NPR about eponyms, nouns that are created from the names of people. Examples are Watts, Zamboni, Zeppelin, Newtons and Volts. Well, it just so happened that my class that day was learning about nouns and proper nouns, so it made sense for me to keep listening while my eggs got cold, and boy, was I rewarded! What came next was a song and YouTube video all about these words that was a lot more fun for my students than their dry worksheet. This then led to looking up examples of eponyms on the net and making PowerPoint slides on each of our words with biographies of the people they are named after. All of this happened nearly spontaneously and reminded me how much I enjoy working in a district that lets me abandon the textbook for a day if I find a better way of doing things.